Lord Gautam Buddha is the founder of the religion Buddhism. 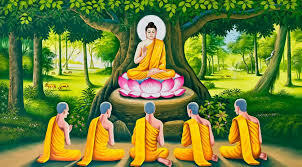 Another Name of Gautama Buddha: Lord Gautama Buddha is also known as Sakyamuni or Tathagata. Date of Birth and Place: Gautama Buddha was born in 563 BC on Vaishakha Purnima day at Lumbini ( near Kapilavastu) in Nepal. Of his birth. Gautama Buddha was brought up by stepmother Gautami. Married life: At 16 years old he married to Yashodhara and was a son named Rahula. Changing moment of his life: After seeing an old man, a sick man, a corpse and an ascetic, he decided to become a wanderer. Left house: He left his house at 29 years old in search of truth (also called “Mahabhinishkramana or The great Renunciation) and wondered for 6 years. Enlightenment: He attained “Enlightenment” at 35 at Gaya in Magadha (Bihar) under Pipal tree. Mahaparinirvana: Lord Gautama Buddha attained Mahaparinirvana at Kushinagar in 483 BC at the age of 80 in the Malla republic ( now U.P). First Buddhist council: First Buddhist council celebrated in 483 BC at Rajgriha under the chairmanship of Mahakassaapa and the King was Ajatshatru. Divided the teaching of Buddha into two Pitakas- Vinay Pitaka and Sutta Pitaka. Second Buddhist council: The second Buddhist council was celebrated in 383 BC at Vaishali under Sabakami and the king was Kalashoka. Followers divided into Sthavirmandis and Mahasanghikas. Third Buddhist council: At Pataliputra , in 250Bc under Mogaliputra Tissa (king was Ashoka). In this council the trird part of Tripitakas was coded in Pali language. Fourth Buddhist council: At Kashmir (Kundalvan), in 72 AD under Vasumitra and the king was Kanishka. Divided Buddhism into Mahayana and Hinayana sects. Vinaya Pitaka: Rules of discipline in Buddhist monasteries. Sutta Pitaka: Largest contains collection of Buddha,s sermons. Abhidhamma Pitaka: Explanation of the philosophical principles of the Buddhist religion.